Last year’s excellent ‘After Laughter’ saw Paramore embrace and fulfil an evolution that had been hinted at on their previous couple of records. Unleashed from the shackles of the emo-rock sound that brought them to the fore, it was packed with synth-influenced pop-rock anthems. Nearing the end of their European dates, next they head to Australia and Asia, before heading home for festival dates. 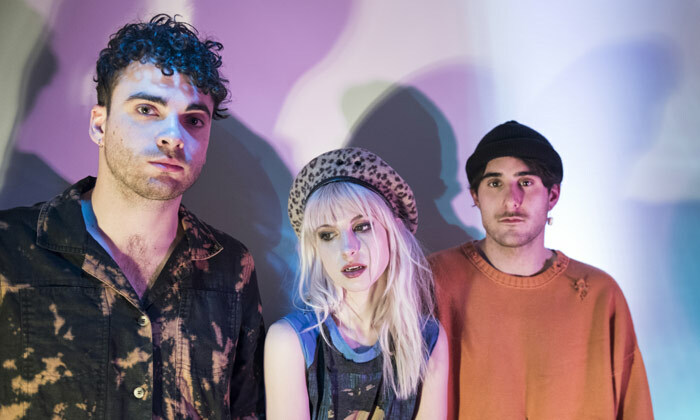 The return of Zac Farro on drums is reinforced by the opening of the show, which sees an extended intro to the party-inducing ‘Hard Times’. A nod to their heavier guitar material comes from ‘Ignorance’, while ‘Still Into You’ is another outpouring of energy between crowd and adoring audience. Gentle moments, such as ‘Forgiveness’ and ‘Hate To See Your Heart Break’ both show off an under-appreciated side to the band, as well as giving Hayley Williams a chance to catch her breath. On the uptempo numbers, she is an enigmatic presence who commands a stage much like Jagger, never missing a beat in her vocals or steps. An expanded seven-piece on stage, the musical backing is focused and intense – there’s certainly no question of the band being uncomfortable or undeserving of the arena setting. The continued set is largely drawn from the best of their latest record – ‘Fake Happy’, ‘Pool’ and ‘Told You So’ – while a leaf from Green Day’s book of how to provide a memorable concert sees some fans partake in ‘Misery Business’. Other catalogue favourites include ‘Ain’t It Fun’ and ‘That’s What You Get’, and perhaps tellingly, their debut album is left unreferenced. The popularity of commemorative anniversary shows for previous albums means this could be a mistake, yet you wouldn’t tell from the reaction of those in attendance. Rather than a set of nostalgia, Paramore are rightly celebrating who they are now, and it makes for a hugely enjoyable show.